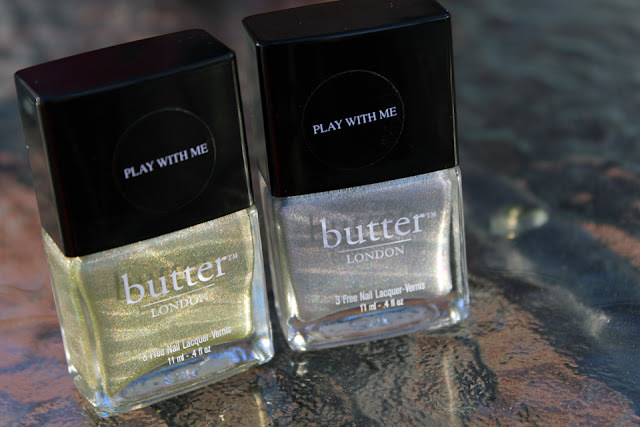 I received two polishes the other day from Butter London's Fall 2012 Collection, courtesy of Nail Polish Canada, that I wanted to share with you: Trustafarian (left) and Dodgy Barnett (right). They are both holographic polishes, which means they are quite shimmery and not for the faint at heart. I will feature Trustafarian in a future post, but today is all about Dodgy Barnett. First, I am loving this polish. The colour, a silvery grey, doesn't look like anything special in the bottle, but the holo is stunning on (especially in sunlight). Secondly, the formula is wonderful. It applies beautifully and seamlessly. It took two coats for an even finish (as shown). 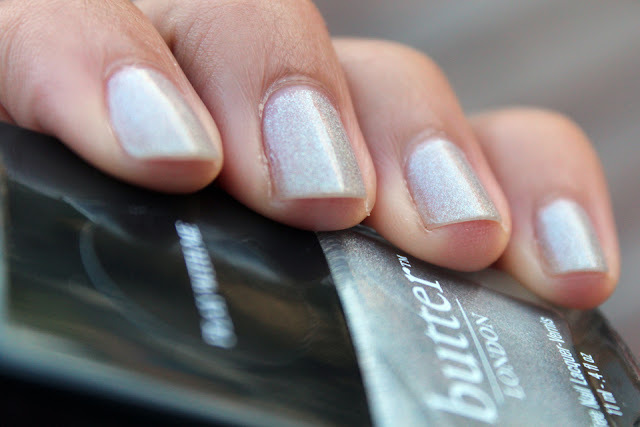 It covers the nail quite well and it has a beautiful glossy finish. I've been wearing it for a couple days now and it still looks great. No chips! Don't you just love these?! I was impatient and swatched both in one day the moment they arrived from NPC, but I wish I had stuck with Dodgy Barnett for just a few days because I loved the colour and holo effect! These are both gorgeous, I love 'em both! So pretty, I want to try holographic nail polishes as it's not something I see too often.